Each individual voucher ($119.00) is valid for TWO Green Fees with Power Cart at Piper’s Heath Golf Club, valid anytime Monday-Friday; or Saturday/Sunday after 3:00pm. Not valid on holiday Monday’s. Each voucher includes shared power cart for two people. 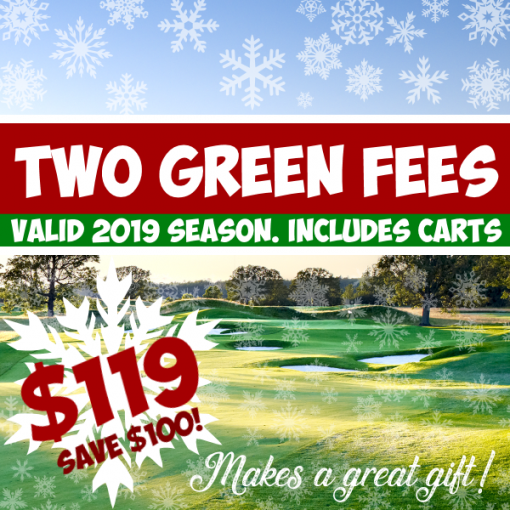 Vouchers must be redeemed by end of 2019 golf season. You may change the quantity ordered above. Maximum of 4 orders per person. You will receive an email shortly after purchase with your unique voucher code(s). Please print off, or keep handy on your smartphone for use at Golf shop check-in on day of play. Or give to that special golfer in your life as a terrific gift! Vouchers are fully transferable. Each individual voucher code is valid for TWO GREEN FEES at Piper’s Heath Golf Club. Valid anytime Monday-Friday (excluding Holiday’s); or Saturday and Sunday after 3:00pm. Does not include range balls. Cannot be used for tournaments, group bookings or other golf events, or combined with any other offer. Vouchers may only be used in TWOs, cannot be split up into single rounds. Bookings can be made up to 30 days in advance. Vouchers expire End of 2019 Golf Season. Expiry extensions will not be granted. Maximum of 4 orders per person. A $2.00 processing fee will be applied at checkout.